If you need to use intermittent catheters, the first thing to know is the differences between the various types of catheters that are available to you. Let’s examine the two main types of urinary catheters that are inserted to drain the bladder. These types of catheters are typically inserted via the urethra or sometimes a stoma. Then once the bladder is drained, the catheter is thrown away after each use. Your doctor or healthcare practitioner will teach you how to insert the catheter yourself since you will likely be self-cathing on a regular basis. They will let you know how often to cath as well. There are three main types of intermittent catheters to know about. This intermittent catheter is the original urinary catheter type, and it has come a long way since the first catheter’s invention. Straight catheters are uncoated, so each one must be manually lubricated prior to insertion. This can be done with the use of individual packets or tubes of sterile lubrication. These are also available in travel-sized pocket catheters, which come in a curved or U-shaped package and can be discreetly tucked into your pocket for easy carrying. Hydrophilic catheters are similar to straight catheters when it comes to the options for various lengths, straight or coudé tip, and pocket catheter or travel-ready options. The main difference is that hydrophilic catheters have a unique coating which, when activated by water, becomes lubricated and ready to use with no need for additional lubricant, as well as less mess and effort. 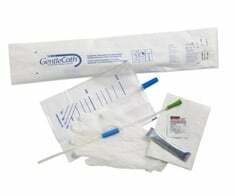 Closed system catheters are all-in-one sterile catheters in a self-contained collection bag. A great catheter for frequent travelers or those in wheelchairs, closed system kits often come with additional insertion supplies like gloves, an underpad, and antiseptic wipes to minimize the risk of infection. They are pre-lubricated and feature an introducer tip to bypass the highest concentrations of bacteria in the urethra as you insert the catheter. If your doctor has determined that you’ll need to use a catheter for a long period of time (or even indefinitely), and an intermittent catheter is not an option for whatever reason, then you may have an indwelling or Foley catheter inserted. This type of catheter is usually placed in your bladder while at a healthcare facility. The Foley catheter is then held in place by a small balloon that is inflated once the insertion tip has reached the bladder. Indwelling catheters can stay in for days or even weeks, depending on a doctor’s recommendation. The downside of using this catheter type is that it can leave you more susceptible to urinary tract and/or bladder infections since it is left inside the body for long periods of time. What Catheter Type is Right for You? At 180 Medical, we carry all the major catheter brands and types, so you have the option to sample what might work best for you and the freedom of choice to pick the brand you prefer. There are plenty of factors to consider when choosing from the various types of catheters available on the market today. Your doctor can help you determine what kind will be best for your needs. With the right research and professional guidance, you’ll be able to make this transition as easily as possible. Contact us at 180 Medical to start receiving the right intermittent catheters for you! Disclaimer: Please note that this post is intended to provide a general understanding of product options that are available on the market. This information should not be used in place of your prescribing professional healthcare provider’s recommendations, based on your personal anatomy and individual needs. Please consult with your doctor to find what type of catheter may be right for you.